No Frakking Consensus: What's Left if We Disregard Non-Peer-Reviewed Claims? What's Left if We Disregard Non-Peer-Reviewed Claims? 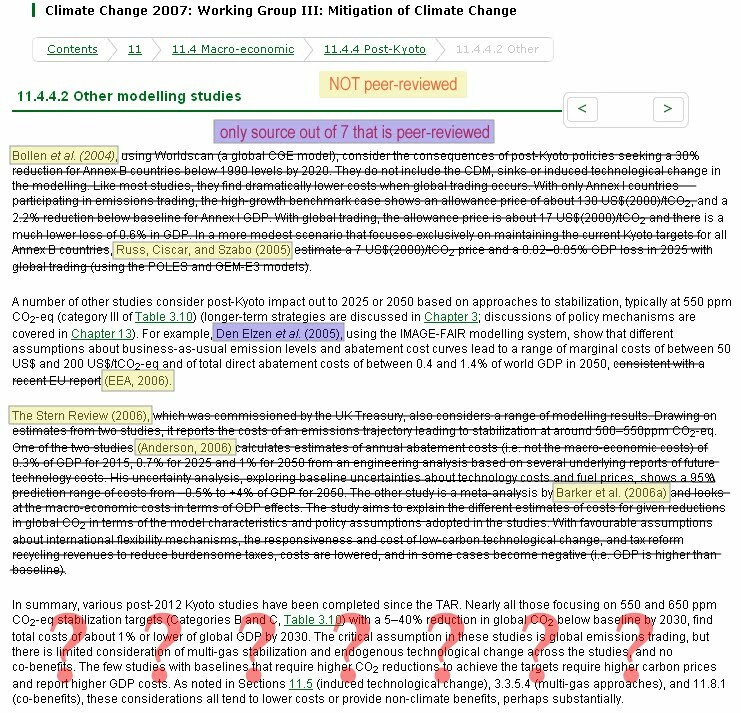 Does it matter that 1 in 3 sources cited by the climate bible aren't peer-reviewed? Yes it does. Because once you strike out all the statements that don't rest on peer-reviewed research there sometimes isn't much left. 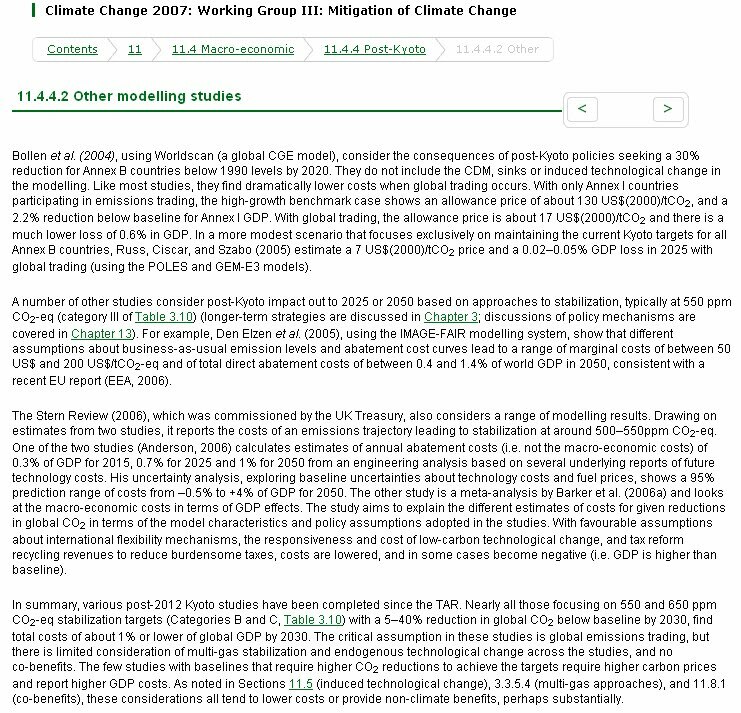 Economist Richard Tol blogged about a particular section of the Intergovernmental Panel on Climate Change (IPCC) report in early March. 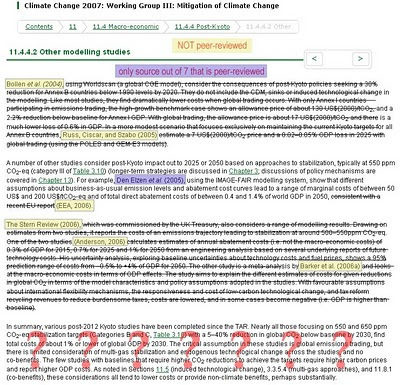 When I took a look for myself, I discovered seven studies in total being used to support the IPCC's point-of-view on this page of the report. That sounds like a reasonable basis for drawing conclusions. But checking the full entry for each of these studies in the list of references provided for that chapter reveals that only one out of seven is a peer-reviewed document. Only Den Elzen et al. (2005) experienced the peer-review process prior to its publication in the academic journal Energy Policy. So if we subtract all the verbiage associated with those six non-peer-reviewed papers how much remains? You can get a better look at the image above by clicking to make it larger. Altogether, the four paragraphs on the page amount to 593 words. But only 98 of those words - 17 percent - are backed up by peer-reviewed research. And remember, according to the IPCC chairman, Rajendra Pachauri, all other research deserves to be thrown into the dustbin (see the end of the linked article). Poll: How Many Non-Peer-Reviewed References?